If you hike from the desert floor near Panther Junction up to the Chisos Mountains, you’ll notice that the plants change quickly as the elevation increases. Big Bend elevations range from about 2,000 feet along the Rio Grande to over 7,000 feet in the Chisos Mountains. Generally, the higher up you go, the less hot and the less dry it is. Below 3,500 feet, you find mostly the “ultimate adapted desert plants,” such as creosote bushes and chola. 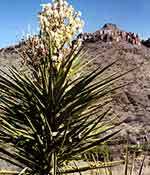 Above 3,500 feet, you’ll begin to see more cacti, mesquite trees, bunchgrass, and yucca. As you pass from 3,500 to 5,000 feet, you’ll be in grassland. At 5,000 feet, you’ll enter woodlands. And along your entire hike, you’ll notice that the plants are separated by tolerance for heat and absence of water. Century plant and rock lichens, Lost Mine Trail (December, 1993) The point where Lost Mine Trail turns away from Casa Grande is a common resting place for hikers on the trail. Plants near here, free from the stunting shade of the mountain woodlands, are shaped by the sun and wind of the peak. We humans consume a lot of water. Experts advise each visitor to carry a gallon of water for each day they spend in the Chihuahuan Desert. Spend some time in the desert and you will find that we simply weren’t built for this environment. Mesquite trees search for water deep below the ground with long tap roots. They have more wood underground than above ground. Like most other desert adapted plants, they grow very slowly. Their small, dry leaves help them conserve water. They also have thorns which discourage thirsty animals from eating the leaves. Every leaf that a mesquite tree has to replace requires extra water. One way to deal with the lack of water is to hold on to every drop that comes your way. For example, human urine is about 95 percent water. The desert turtle—a tortoise—excretes uric acid crystals which only contain one to five percent water. It’s solid urine, not liquid. Meanwhile, when desert turtles find water, they can drink enormous quantities—some have been reported adding over 40 percent of their body weight. Also, to avoid the heat, desert turtles have been known to burrow as far as 30 feet below the surface.